US existing home sales disappointed again in January, falling 3.2% to a 5.38 million unit pace with sales declining in all four regions of the country. The sluggish pace of existing home sales is linked to the fact that supply remains historically low. The inventory of existing homes on the market rose in January but remains 9.5% below last year’s level. Existing home prices have continued to rise in light of the tight supply story and are now up 5.8% on a year-over-year basis. Even with the current tight supply situation and rising prices, home sales are expected to accelerate this year to a 5.65 million unit pace in 2018. A 1.0% rise in the US Leading Economic Index (LEI) in January marked the fourth consecutive month of increases in the index. The largest contributors to the headline reading were the interest rate spread, as yields moved higher for the month, and the Institute for Supply Management’s new orders component. The solid LEI readings suggest that quarterly annualised GDP growth should continue in the 2.0% to 3.0% range over the first half of this year. Besides the passage of the $1.5 trillion tax package on 20th December of last year, there have been a number of other catalysts on the US Treasury supply front that have played a role in moving yields higher. Many of these factors are related to an expected pickup in Treasury supply coming online at the same time that global demand for US Treasuries has begun to wane. The first of these supply signals was the Quarterly Refunding Announcement (QRA) on 31st January which indicated that the Department of the Treasury intended to increase auction sizes for the two-year and three-year note by $2 billion per month, the 5-year, 7-year and 10-year notes and 30-year bonds by $1 billion in order to service larger budge deficits and the reduction in reinvestments in the Federal Reserve’s portfolio. Relative to market expectations the QRA put more weight on new issuance on the back-end of the yield curve. FOMC minutes certainly took centre stage especially with its shift towards a more hawkish bias, cementing the case for an interest rate hike in March. Policy makers saw “substantial underlying economic momentum” and turned more confidence that inflation is “moving up” while the labour markets continued to tighten. Fed officials further highlighted that the strengthening US economy “increased the likelihood that a gradual upward trajectory” of the Fed Funds Rate would be appropriate, shifting away from its usual subtle tone of “further gradual increases”. Futures implied probability of a March rate hike has since shored up to 100% since the 31st January FOMC meeting. Most of the US major indexes ended the holiday-shortened week with modest gains. The technology-heavy Nasdaq Composite Index performed best, helped by strength in semiconductor stocks early in the week. Better-than-expected results from Hewlett-Packard gave a further boost to tech shares on Friday. Utilities and materials stocks also performed well, while real estate shares lagged. Consumer staples shares also under performed, as Wal-Mart sold off early in the week following an earnings miss and guidance that disappointed investors. The Fed’s January meeting also predated federal government spending increases that were signed into law on 9th An eye needs to be kept on whether the fiscal stimulus from the budget agreement will further bolster policymakers’ confidence in their growth and inflation outlook. In combination with recent tax cuts, the budget agreement is also likely to increase government borrowing considerably; many observers anticipate that annual federal deficits will exceed $1 trillion in coming years. The week brought evidence of the first ramp-up in government borrowing, with roughly $258 billion in new Treasury issuance, according to Bloomberg. As the market absorbed the new supply, the yield on the two-year Treasury note climbed to its highest level in decade. This week US core capex figures for January are scheduled to be released on Tuesday. Due to the tax reform and high business confidence pointing at sustained investment activity, core capex are expected to increase further in coming months but it is very volatile from month to month. PCE inflation figures are due on Thursday. Based on the higher-than-expected CPI inflation numbers for January, PCE core inflation is expected to come in at 0.3% month-on-month (1.6% year-on-year, up from 1.5% year-on-year in December, which would be the highest since March but still below the Fed’s 2.0% target). While core inflation seems to be moving higher, a few releases coming out more strongly than expected should not carry one away. Usually, there is some noise in the data. Still, the reflation theme is unlikely to go away anytime soon. On Thursday, ISM manufacturing figures are also due for release. Markit Manufacturing PMI preliminary numbers for February came in at 55.9, which is the highest level since October 2014. The big gap between ISM and PMI manufacturing remains puzzling. The ISM manufacturing index is expected to be broadly unchanged at 59.1 in February based on the regional and nationwide PMIs. GDP growth in the UK in Q4 was revised down to 0.4% in the second release, from 0.5% in the first estimate. The GDP growth rate for 2017 was also revised down to 1.7%, from 1.8% previously. The consensus estimate was for no change. On the supply side, the downward revision was driven by revisions to production estimates, partially offset by upward revisions to construction. The largest contributor to GDP growth was, as always, the services industries, which increased by 0.6% overall. Production output was estimated to have increased by 0.5%, revised down by 0.1 percentage points from the preliminary estimate of GDP. Construction output was estimated to have decreased by 0.7% in Q4, revised upward from a decrease of 1.0% in the preliminary estimate of GDP. This is the third consecutive quarter of contraction for the construction sector. On the demand side, growth in private consumption was broadly unchanged from Q3, contributing 0.21 p.p. to overall GDP growth in Q4 after 0.24 percentage points. in Q3. The annual rate of growth in private consumption for 2017 was 1.8%, compared with 3.1% in 2016. This is the lowest rate of annual growth in household spending since 2012. According to the ONS, the lower rate of growth can in part be explained by the rise in prices faced by consumers. Gross fixed capital formation contributed 0.18 percentage points to GDP growth in Q4, up from 0.12 percentage points. in Q3. However, business investment was flat, while general government investment and capital formation in private dwelling sectors contributed the most, growing by 5.6% and 1.4% respectively. The flat quarter-on-quarter performance of business investment in Q4 follows growth of 0.9% in Q3. Both exports and imports pulled down GDP growth, with a combined negative contribution of 0.5 p.p. from net trade. However, the trade in non-monetary gold affects the numbers. Stripping out that effect, the contribution was -0.1 percentage points. Focus remains on Brexit, as the important EU summit on 22nd and 23rd March is nearing, where the ambition is to reach an agreement on transition. Based on news stories, there remain a few hurdles but these should be relatively easy to solve. More problematic are the upcoming discussions on the future relationship but here the two sides are expected to find a compromise before the deadline. Reports suggest Prime Minister Theresa May is set to give another Brexit speech this week. UK PMI manufacturing index for February is due. Usually, the UK index follows the equivalent euro area index but, in recent months, the UK index has been running below the euro area index. As the euro area index has peaked, the upside potential for the UK index is limited. The index is likely to remain broadly unchanged around 55.3. The preliminary EU February Composite PMI decreased more than expected to 57.5, from the almost 12-year high of 58.8 in January. The decrease was almost in line with consensus expectations and thus the biggest in five years. While this curbs the healthy economic sentiment from the previous months, it was unlikely that the unexpectedly high confidence reading from the previous months could be sustained. The recent agitations in financial markets probably partly explain the sharp decline, and it will be interesting to see if sentiment recoups some of the loss in next month’s readings, as the market volatility seems to have abated for now. Even though PMI decreased more than expected, it suggests that GDP growth could pick-up in the first quarter. Other indicators also showed sentiments in the Eurozone have turned softer. 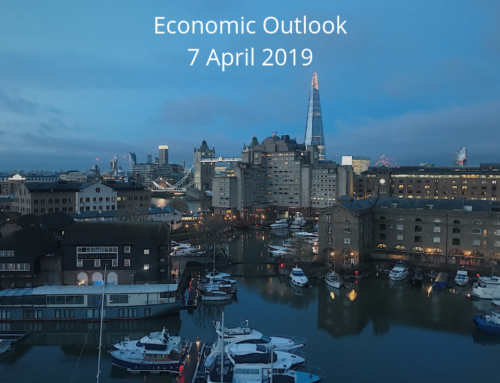 ZEW survey showed economic sentiments softened in February while consumer confidence pulled back sharply in the same month, raising concerns if the Eurozone economy has seen its best days. The European Central Bank (ECB) published minutes from its January meeting that showed that some hawkish officials had pushed for removing a commitment to increase quantitative easing if necessary. Some members expressed a preference for dropping the easing bias. However, policymakers concluded that an adjustment was premature and not yet justified by the stronger confidence, according to the ECB Governing Council’s account of the monetary policy meeting. European stocks ended the week flat to mixed amid relatively low volume. Despite a heavy week of corporate earnings reports and positive economic indicators, major indexes in the region were subdued. European shares shifted between small gains and losses while searching for direction during a time when the US and some Asian markets were closed early in the week for holidays. The pan-European index STOXX 600 index was essentially flat, as investors seemed to be on guard about the prospect of rising inflationary pressures. The German DAX 30 ended marginally higher following reports of solid demand for German exports. Greek government bonds rallied late in the week following an upgrade by credit rating agency Moody’s Investors Service, although yields on Greek debt were up overall for the week. Moody’s upgraded Greek debt to B3 and maintained the positive outlook as the country’s economy continued to improve. The yield on 10-year Greek government bonds was around 4.4% by the end of the week. Italian bonds sold off on political uncertainty ahead of national elections. Recent opinion polls suggest no party will win enough votes to form a government following the elections set for 4th March; the result would be a hung Parliament. If no coalition government can be arranged, another election becomes likely. For the week, the yield on Italian 10-year government bonds rose to about 2.07%. In the euro area, the HICP figures for February are due for release on Wednesday. In January, headline inflation fell 0.1 percentage points to 1.3% and we expect a similar decline in February, to 1.2% due to base effects in energy and food price inflation. The dip to 1.2% should be temporary and headline inflation is expected to bounce back to the 1.4% to 1.5% level in March/April as the base effects wear off. Chinese stocks advanced in thin trade on a holiday-shortened week after domestic financial markets were closed for the weeklong Lunar New Year holiday. The big news took place in China’s corporate sector the previous Thursday, when the government unexpectedly took control of a well-known insurer and signalled it would prosecute the insurer’s former chairman for fraud. In a letter published on its website, the China Insurance Regulatory Commission said that it was temporarily taking over management of Anbang Insurance Group Co., one of China’s most acquisitive conglomerates. The takeover of Anbang, which marks the Chinese government’s biggest-ever takeover of a privately owned company, was viewed as the clearest signal to date of Beijing’s determination to rein in surging corporate debt. Anbang’s rapid growth was fuelled by selling investments resembling high-yielding investment products, as opposed to traditional policies, raising concerns about its financial stability. Over the past year, Beijing has stepped up a campaign to crack down on excessive financial risk-taking and slow the pace of debt build-up in the economy. The most important economic data release in China is the PMI manufacturing data. A small decline in Caixin PMI manufacturing to 51.3 in February would be in order, down from 51.5 in January; in line with Consensus. While a sharp decline in credit growth points to a decline in PMI over the next year, short-term indicators for PMI (steel production, metals prices) are still holding up fairly well. The official PMI manufacturing data are also due for release. They have declined somewhat in recent months but overall stayed at a decent level.